Mohamed Affandi speaks to servicemen in this file photo. KUANTAN: The Malaysian Army is tightening security control at the country’s borders to curb firearm smuggling. 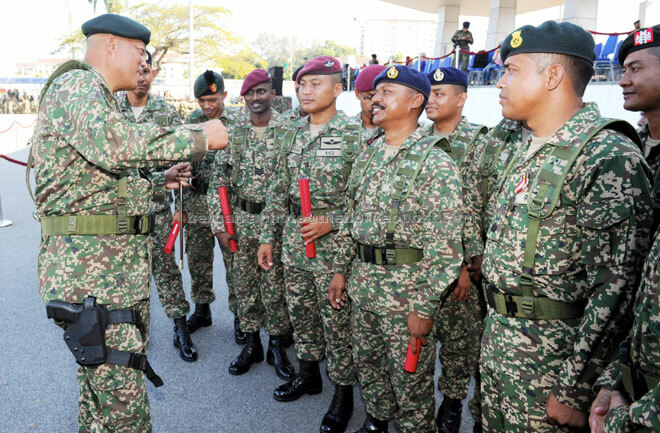 Its chief Tan Sri Raja Mohamed Affandi Raja Mohamed Noor said he had directed the Field Commander to ensure that all personnel based at the borders be required to conduct periodic exercises to gauge security level. “Personnel working there will continuously monitor security and we will make every effort to prevent firearm smuggling. “Smuggling can be in many forms and ways,” he told reporters when met at the army’s Aidilfitri gathering at Darlockwood Camp here last night. He was asked to comment on a Buletin TV3 news report attributing the shooting incidents in the country, that had escalated of late, to firearm smuggling activities at the border, and the small fee for a hired killer. Also present at the function were Defence Deputy Minister Datuk Seri Mohd Johari Baharum and 4th Brigade (Mechanised) commander, Brigadier General Datuk Md Din Abu. Raja Mohamed Affandi said the Malaysian army also has good cooperations with the Royal Malaysian Police in operation coordination at the borders.